At 6:00pm CT, temperatures around southeast Missouri, southern Illinois, and western Kentucky range from 30° in Mt. Vernon, Illinois to 38° in Poplar Bluff, Missouri. A weak disturbance is moving through creating snow flurries at times. The air is drier in the bottom 2,000' of the atmosphere so much of what is showing up on radar imagery is most likely not reaching the ground. As mentioned earlier, another disturbance is forecast to come out of the Rockies and quickly dive to the southeast over the weekend. As the surface low develops moisture is likely to develop on the east/northeast side of the low. As the surface low moves in towards the KFVS viewing area moisture could start to fall and reach the ground. Initially it will fall as a rain/snow mixture before turning over to sleet. You can see this a little easier by looking at the afternoon run of NOAA's global forecast model. The above model data is depicting the weather for Cape Girardeau. Blue vertical bars indicate snow. 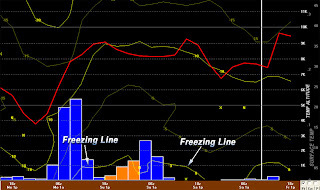 Orange vertical bars indicate sleet. During the initial rain/snow period the model is depicting 0.1" of liquid to work with. If it were to fall as all snow we could be talking 1.2" to 1.5" of snow. As the system swings through cold air will start to usher in on the back side. If this model is correct, available moisture should increase meaning the snow should increase. The models are spitting out 0.35" of liquid which would turn in to an additional 4"-5" of snow on the back side of the low (round 2). There are several elements in play that are keeping me from totally buying in to this solution. Lets talk temperatures... Temperatures are extremely important for a snow accumulating storm. The red line in the above graphic shows the surface temperature. You can see temperatures will be straddling the 32°-33° range Saturday evening through Sunday morning. You can get an idea what the temperatures are by looking at the scale on the far right in gray. Look at the yellow lines in the graphic. The yellow lines indicate the temperature at different levels of the atmosphere. Look to the right and you can see a scale of altitude in 1,000's of feet indicated in white. This run of the forecast model tries to bring in some warmer air at the surface starting late Saturday morning. It takes temperatures above freezing (0°C/32°F) and hugs the warmer air at the surface through Sunday night. If this is the case, a lot of what falls would be very "wet" and probably have a hard time accumulating. As far as where most of the snow should fall will be over southern Illinois. Parts of southeast Missouri as well as western Kentucky could see the snow too. The temperature profile and the models depiction of all of the available moisture in the atmosphere are two reasons why I am not buying the heavier snowfall predictions just yet. Also, historically, clippers like this don't usually bring this much snow to this region. 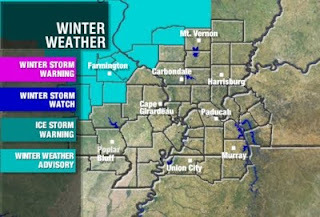 While typing this up the National Weather Service in St. Louis has just issued a Winter Weather Advisory for several counties in southeast Missouri and southern Illinois. The advisory will be in effect 6:00pm Saturday evening through midnight Sunday night. In the advisory area they are calling for 2"-5" of snow. I have had a few people asking why I haven't been keeping the blog up-to-date over the last two days... Believe it or not I usually update the blog on my time off from work. It has been very busy the last couple of weeks in the weather department so I decided to give myself a couple of days off from taking time to update the blog. I wish there was a way to automate the process of going over all of the data, creating the graphics, and finally putting all my thoughts in to words. I usually spend an hour (if not more) going through the entire process. I will be working my usual shift at the station Saturday and Sunday so I'll have more on Heartland News both days but I will also be keeping the blog up to date (time permitting).